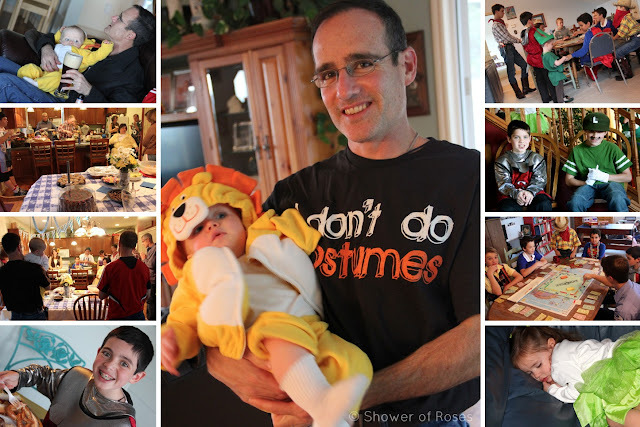 This past Saturday Rascal's godparents, who just came back from a trip to Germany, decided to host an Oktoberfest/Costume Party. 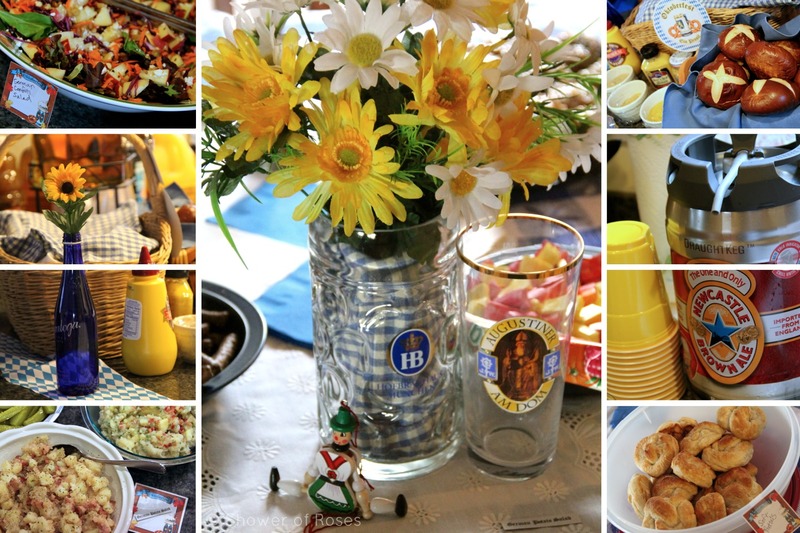 They served German wursts, German potato salad and sauerkraut. Everyone was asked to bring a German food or dessert to share, and dress in fun, modest and not scary costumes! After our crazy couple days, I had to keep it simple and just picked up Pretzel Slider Rolls and Apple Strudel from Costco, but it was so nice to get out and visit with friends! 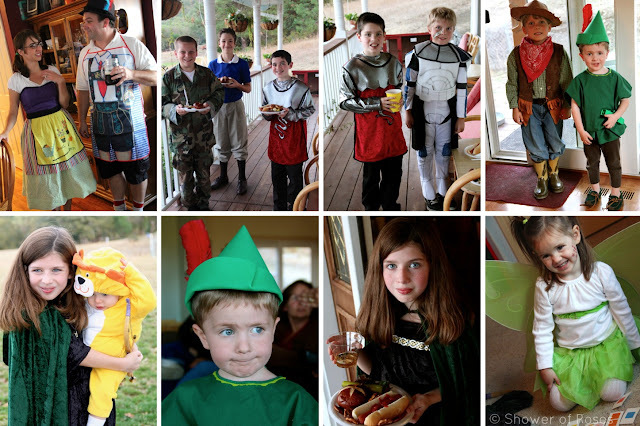 I tried my best to convince the kids dress up as the 7 dwarves, and I could go as a (non-Disney) version of Snow White, with Hubby dressing as Prince Charming The Huntsman. But they wouldn't go for it! ;) I had a couple girls, one in particular, that just didn't like the idea of dressing as a boy dwarf! In the end, I liked their idea better, anyways. 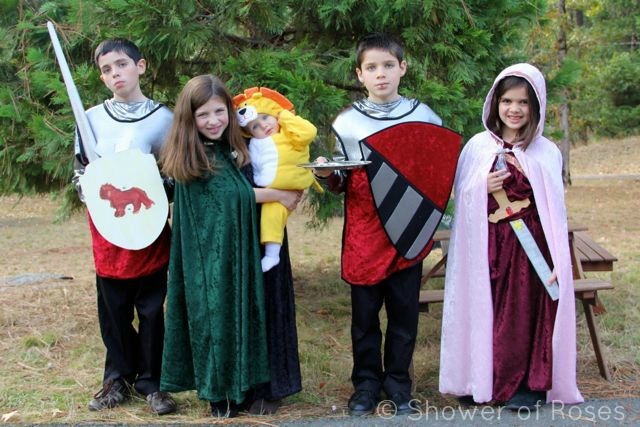 The four oldest decided to dress as Peter, Susan, Edmund and Lucy from The Chronicles of Narnia. Edmund even had an injured lip from being hit by the White Witch! They even decided to dress Bud up as a lion to represent Aslan. Isn't he just the cutest little lion ever? As I mentioned in my Daybook, Snuggles insisted on dressing as Peter Pan and came up with most of his costume on his own! Our little Pixie (as we affectionately call this petite youngest daughter of ours) dressed up as (a modestly dressed) Tinkerbell. Now to finish preparing the Saint Costumes for this week's Costume Party at our Parish, and our upcoming All Hallows' Eve Party on the 31st here at our home! Can you tell us where you got those marvelous capes for the girls? They (the capes but especially the girls) are beautiful! How fun! Great costumes, too. I love the Narnia and Peter Pan theme. Cute! Great costumes! How much fun! An I think it's so nice your daughters are so feminine regarding their costumes! Thank you for your comment! God bless you for running a group... It's a lot of work leading, but so worth the effort! I love the battle-ready faces on your big boys! And never have I seen a more modest Tinkerbell. And I could just cuddle that little lion all day long! Oh, yes, they were trying very hard to keep a straight face! 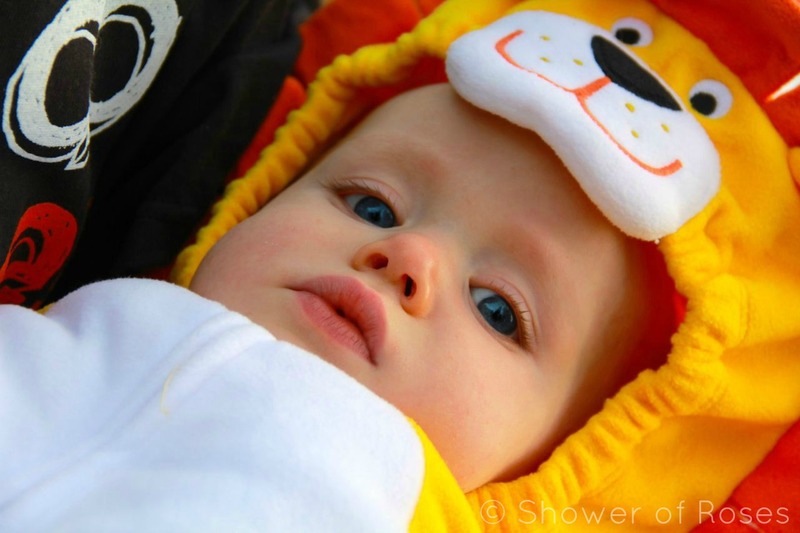 :D Looking forward to the day you do get to cuddle that little lion... Hopefully he won't have outgrown the cuddle stage! He needs to meet his godmother soon! Love! Your kids are so cute! Can you please direct me to your post about the party you hosted last year? I can't seem to find it and really could use some inspiration. Thank you! I updated this post with a link to the label for All Hallows' Eve. Here is last year's post: Sanctifying Halloween :: Celebrating the Saints! And you can find all the individual links listed in my Links for October :: Month Dedicated to the Most Holy Rosary - just scroll to the bottom. Cute - cute - you always make things come together so nicely - as if it is so easy! I know it is not, but you sure have a knack for it! We have a Toyota Siena. It only has 8 seats, so we are currently one seat short... We are hoping and praying to be able to purchase a larger van, but at this point everything is going to Dental bills. Someday. In the meantime we still have enough seats when it's just the kids and I (which is most of the time) and two of the kids double buckle on occasion (5 miles to Mass on Sundays and events like this). If we have far to go we are going to need to start taking two cars as the kids get bigger. 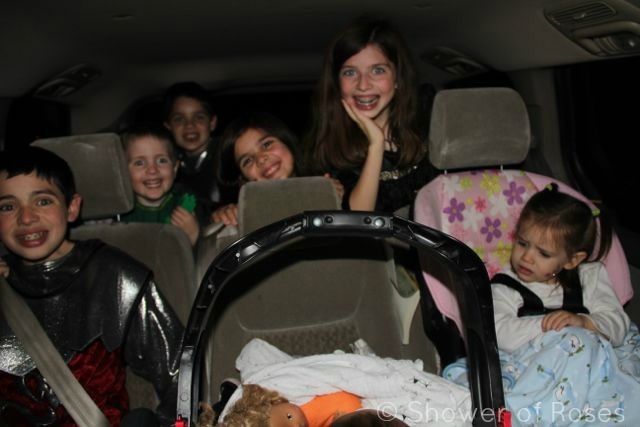 I've loved the Sienna, and will miss it when we do go to a larger car. Beautiful family, beautiful pictures, and beautiful format! If my husband would wear a T in public, ESPECIALLY with words on it, this would be one he'd boast! I'm so glad that you reminded me of ourcoatsofmanycolors too! I still have one or two who could use one of these costumes - especially the boys! Happy Month of the Holy Rosary! Isn't his t-shirt great! And totally NOT FAIR! ;) It was perfect for my husband! Looks great. My daughter decided a few months ago that she wanted to be ST Kateri and has been hard at work at her costume. It's fairly elaborately beaded for what Kateri would have had, but hey she's a saint now, she deserves a little sparkle. We are just hoping that we have a Halloween this year. Huge storm forecasted for the early part of the week. Last year, we had our only snow storm right before Halloweem and there was no electricity and massive flooding. Please pray for the "Princess and the Kiss" book reading party, it is scheduled for this Sunday and I am going to have to make a judgement call. The girls are all so excited, it will be a shame to have to cancel. I have the activities all ready to ship to your girls once we get to have the party. Take care and enjoy the week, sound like you have a lot of great things planned as usual. Praying for you, the storm, and your meeting this weekend! I've also been meaning to email you back for awhile now, but am way behind once again! Looking forward to hearing about your meeting, if you are able to have it. This is my first year to homeschool and I am finding your past posts so helpful in planning our activities for this week! I really appreciate the time you have put into sharing your great ideas. Yay for homeschooling! Glad to hear my posts have been helpful! Have a wonderful and blessed school year! 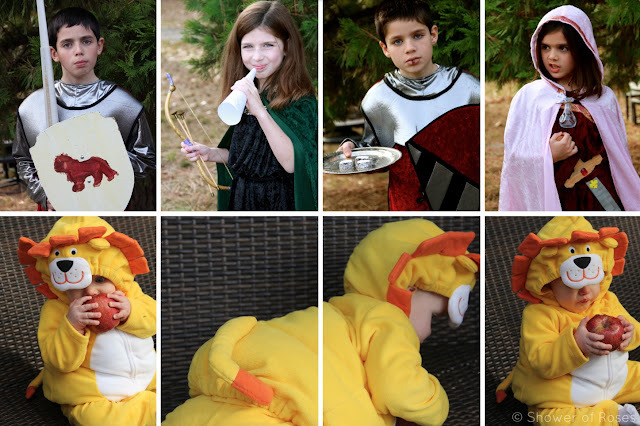 As you can probably guess, we love your costumes! ;-) They all look fabulous, and so sweet to have Aslan with them. So glad Edmund is feeling better and having fun after such a hard time. 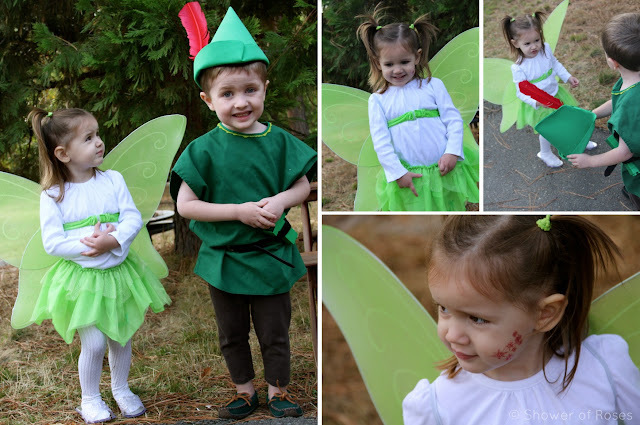 (hope he didn't have too much Turkish delight at the party)That's also the sweetest Tinkerbell and Peter Pan ever! AND Peter Pan & Tinkerbell - very sweet! I love the costumes. It looks like it was such a blast! Wish we could have gone!